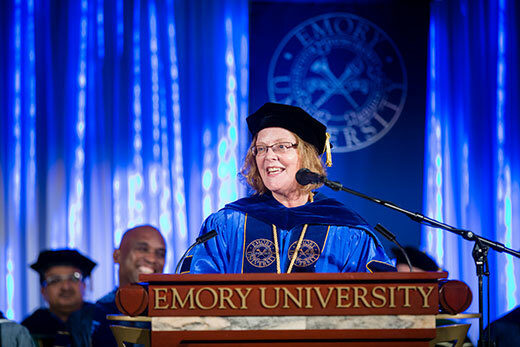 Emory University President Claire E. Sterk speaks Tuesday, Aug. 28, at Emory Convocation, the tradition-steeped opening ceremony for the academic year. The nine schools that make up Emory University have big plans for the 2018-19 academic year. Get the stats on their incoming classes, plus a roundup of what's on tap for this semester — from new degree programs to new faculty — as listed by each school. Incoming class: Candler welcomes 187 incoming students from nine countries, 27 states and 42 denominations. New faculty: Joining the regular faculty are Antonio Alonso, assistant professor of theology and culture and director of Candler’s new Catholic Studies program; Alison Collis Greene, associate professor of American religious history; Susan B. Reynolds, assistant professor of Catholic studies; and Damon Williams, assistant professor in the practice of practical ministry and co-director of the Baptist Studies Program. Seven more scholars are visiting faculty this year. New program: This semester marks the launch of the Catholic Studies program at Candler, designed to prepare leaders and scholars for ministry in the Catholic Church and research in the Catholic intellectual tradition. Noteworthy events: Cardinal Kurt Koch, president of the Pontifical Council for Promoting Christian Unity at the Vatican, will present the public lecture “Toward a Full Communion: Hopes, Achievements, Obstacles and Challenges” on Sept. 18. On Sept. 27, Washington Post columnist and NPR commentator E.J. Dionne will address “Can We Do Justice and Love Mercy in Politics? American Religion, Inequality and Populism.” On Oct. 10, activist, writer and scholar Angela Davis will speak on “1968: Lessons from Fifty Years of Change.” Noted scholar Walter Fluker, distinguished visiting professor in the Alonzo L. McDonald Family Chair in the Life and Teachings of Jesus and Their Impact on Culture, will present “Walking with God: Preparation, Presence and Practice” on Oct. 23 and “Speaking from Sites Reserved for the Dead: Lingering Memories of Martin Luther King Jr. and The Great Mistake Jamestown Made Long Ago” on Nov. 29. All events are free and open to the public, but registration is required. Incoming class: The Emory College Class of 2022 includes 1,440 students, chosen from the largest and most competitive application pool to date. New faculty: Emory College of Arts & Sciences welcomes 23 new tenure track faculty and six lecture track faculty to campus the year. They represent multiple disciplines across the humanities, social sciences and natural sciences, and many are already renowned scholars in their fields. They include best-selling novelists Tayari Jones, author of 2018 Oprah Book Club pick “An American Marriage,” and T Cooper, author of eight novels, including the best-selling “The Beaufort Diaries.” They join Emory’s nationally renowned Creative Writing Program. New major: Philosophy, Politics, Law: Targeted to students interested in legal and political careers, this new major in Emory College’s Department of Philosophy will focus on the history of political philosophy, philosophy of law, training in logic, and multidisciplinary exposure to politics and law. The major supports the pre-professional goals of students with a deep grounding in liberal arts education that involves historical perspectives, critical thinking, clear communication and knowledge acquisition in the field. New minor: Quantitative Sciences: The new minor adds an option for students in Emory College’s increasingly popular Quantitative Sciences program. It offers students the opportunity to enhance their statistical and computational skill sets within a liberal arts perspective that focuses on technical skills as well as how to understand, interpret and question big data and apply it across multiple fields. Emory College’s Institute for Quantitative Theory and Methods (QTM) launched the nation’s first Quantitative Sciences major in 2014, and several peers have since followed with their own QSS programs. New(ish) departments: The Mathematics and Computer Science Department has now become two standalone departments. Strategic priorities: Emory College is focused this year on working toward fulfilling the goals for academic excellence outlined in “Leading the Liberal Arts and Sciences: Strategic Priorities for Emory College,” which launched last spring. Incoming classes: Goizueta recently welcomed its Two-Year Full-Time MBA Class of 2020. The class is made up of 181 students who represent over 20 different countries; 23 have memberships in the Consortium for Graduate Study in Management. The class also includes 11 U.S. military veterans who represent the Army, Navy, Marines and Coast Guard. Additionally, Goizueta’s Master of Science in Business Analytics Class of 2019 arrived on campus. Made up of 44 students and representing eight different countries, the cohort includes one Fulbright Scholar and five BBA/MSBA joint degree students. #GoizuetaENGAGE conference: Save the date for the third annual #GoizuetaENGAGE conference happening Oct. 5 from 8 a.m.-4 p.m. at the Ritz-Carlton in Atlanta. The conference will bring together businesses in support of women's equality and advancement, as well as alumni speakers and industry leading minds in a collaborative effort unmatched within the city's history. The day-long event will feature panels, workshops and speakers to help stoke passions, identify opportunities and advance careers at every stage. Registration opens Sept. 1. To register or learn more, visit emory.biz/engage. Incoming class: LGS welcomes more than 400 new students, representing 51 countries and 38 states of the United States. More than 78 percent of new students are pursuing the PhD. New leadership: LGS is pleased to welcome Sina Safayi as the inaugural LGS assistant dean for professional development and career planning. Safayi’s work in higher education has supported the academic, social, career and professional development of undergraduates, graduate students and postdoctoral scholars in both national and international contexts. Safayi will oversee LGS professional development and career planning with particular emphasis on design and delivery of programs to prepare students for a range of career pathways. Annual symposium: From Sept. 30 – Oct. 2, the Laney Graduate School will convene the STEM Research and Career Symposium. The STEM Symposium brings faculty advisers and nearly 100 students from diverse backgrounds to the Emory campus for two days of shared research presentations and for networking, mentoring and recruitment. The keynote speakers for this year are José Antonio Bowen, president of Goucher College, and Charlie Garnett-Benson, Laney Graduate School alumna and associate professor of biology at Georgia State University. Social media: LGS is expanding its coverage of students, faculty, alumni and important events on its social media platforms. Like or follow LGS on Facebook, Twitter and Instagram @LaneyGradSchool. Incoming and returning classes: The School of Nursing welcomes 897 students for the new academic year: 133 traditional BSNs (71 new, 62 returning), 213 Accelerated BSNs (111 new, 102 returning); 231 FTE MSN students; 58 FTE DNP students. New faculty: Jinbing Bai, assistant research professor; Brittany Butts, assistant professor; Jeannie Cimiotti, visiting associate professor; Ashley Coombe, assistant clinical professor; Heather Englund, assistant clinical professor; Sara Edwards, assistant clinical professor; Elaine Fisher, clinical professor; Jennifer Frediani, assistant research professor; Yin Li, assistant research professor; and Teresa Yambo, associate clinical professor. Faculty honors: Nursing faculty Dian Dowling Evans, clinical professor; Anne Fitzpatrick, adjunct associate professor; Twilla Haynes, adjunct professor; Lisa Muirhead, associate clinical professor; and Mary Dixon Still, Emory Healthcare clinical nurse specialist, were selected as fellows of the American Academy of Nursing (AAN), along with nursing alumna Katherine Finn Davis and Mary McCabe. Emory has 40 AAN fellows, one of the largest concentrations in the country. New programs: The School of Nursing now offers a 12-month Distance Accelerated BSN (D-ABSN) degree option for second-degree students living outside of the Atlanta area and across the U.S. Through the program, students will have an opportunity to study and gain clinical experience in the communities where they live. Thirty students will enroll this fall. Incoming class: Oxford welcomes 533 first-year students, who are drawn from 42 states, the District of Columbia, and 10 foreign countries. Thirty-nine percent of the entering class applied through the Early Decision process. Total enrollment is 990, and this is the most highly credentialed student body in Oxford’s history. New associate dean: Margaret McGehee, associate professor of English and American studies, has been appointed associate dean for faculty development and director of Oxford’s Center for Academic Excellence. New faculty: Oxford has appointed eight new tenure-track faculty members and two new lecturer-track faculty members, its largest faculty cohort to date. These include Anouar El-Younssi, assistant professor of Arabic; Deepika Das, lecturer in biology; Nick Fesette, assistant professor of theater; Devon Goss, assistant professor of sociology; Jessica Ham, assistant professor of anthropology; Emily McLean, assistant professor of biology; Simbarashe Nkomo, assistant professor of chemistry; Alix Olson, assistant professor of women’s, gender, and sexuality studies; Austin Scharf, assistant professor of chemistry; and Cristina Tarazona, lecturer in Spanish. Construction highlights: Construction is expected to begin in November on a long-awaited new campus life center, located on the site of the old dining hall at the intersection of Pierce and Wesley streets. Completion is projected for early 2020. Phi Gamma Hall, built in 1851 and Emory’s oldest academic building, is currently under construction for refurbishment. When the project is complete in October, the building will be ADA accessible and have updated finishes and other improvements that will make Phi Gamma Hall a signature event space for the university. The new official address of Oxford College is 801 Emory Street, the point at which it intersects with Pierce Street. As the result of a summer renovation project, visitors driving into this main entrance will find hardscape and landscape improvements, more aesthetic street-lighting, and increased parking. Select honors: Xu Ji 13MSPH, 17G has been selected as the 2018 recipient of the Academy Health Outstanding Dissertation Award. This national award is presented annually in recognition of an outstanding doctoral thesis in health services research or health policy from the previous year. The American Statistical Association (ASA) recognized biostatisticians from Rollins’ Department of Biostatistics and Bioinformatics for their excellence in the field. Michael Kutner, professor, was selected as the 2018 recipient of the 2018 ASA Mentoring Award, while Ying Guo, associate professor, and Dionne Price 00G were both chosen as ASA Fellows. Kathleen Miner was named the 2018 recipient of the Charles R. Hatcher Jr. Award for Excellence in Public Health. Miner is the associate dean emeritus for applied public health and professor in both the Executive MPH program and the Department of Behavioral Sciences and Health Education. Community engagement: A multi-disciplinary team of experts from across Georgia led by Rollins instructor Daniel Rochberg has developed the “Georgia Climate Research Roadmap,” a first-of-its-kind list of 40 key research questions that can help policymakers and practitioners better understand and address climate change in Georgia. The Roadmap, published in the journal Environmental Management, is an initiative of the Georgia Climate Project, a statewide consortium founded by Emory University, the Georgia Institute of Technology, and the University of Georgia to improve understanding of climate impacts and solutions in Georgia. Notable awards: Howard Chang and Yang Liu, both associate professors of biostatistics, received one of IBM's Climate Change and Environmental grants, which provide technology resources to assist research on climate change and environmental issues. They were selected from a pool of more than 70 applicants for their project aimed at examining the impact of climate change on temperature and air pollution on human health at the local level. Incoming class: Emory Law greeted returning students and welcomed new students from 36 states and the District of Columbia and more than 16 countries to pursue JD, LLM, JM and SJD degrees. New faculty: Joining Emory Law are Rebecca Purdom, professor of practice and executive director for Graduate and Online Programs, and Karen Cooper, visiting professor of practice. Recent faculty promotions and honors: Dorothy Brown was named the Straus Distinguished Visiting Professor at Pepperdine Law School for the Spring 2019 semester. She was also the co-recipient of the 2018 Clyde Ferguson Award by the Executive Committee of the AALS Section on Minority Groups. Laurie Blank, director of the International Humanitarian Law Clinic, was named director of the Center for International and Comparative Law. Michael Broyde won a Fulbright award to spend the 2018-2019 school year at Hebrew University, studying religious arbitration in diverse western democracies. Mary Dudziak was selected as an honorary fellow of the American Society for Legal History. Martha Fineman won Albany Law School’s Miriam M. Netter ‘72 Stoneman Award. Timothy Holbrook was named Asa Griggs Candler Professor of Law, and has also been named Emory University Vice Provost for Faculty Affairs. Jonathan Nash was named director of the Emory University Center for Law and Social Science. Ani Satz was elected president of Faculty Council and University Senate for 2019-2020. She was also appointed to Emory University's Class and Labor Steering Committee. Incoming classes: The SOM has 1,075 students total and trains 1,314 resident fellows in 106 ACGME-accredited programs. The medical school has 553 MD students, 93 MD/PhD students and 534 students across five allied health programs: physical therapy, physician assistant, anesthesiologist assistant, genetic counseling and medical imaging. The school has 2,814 full- and part-time faculty and 795 volunteer faculty. Incoming MD class:The Class of 2022 began their first year of medical school in late July. The incoming class has 138 students: 56 percent women and 74 percent non-traditional (one or more years out of college prior to beginning medical school). They come to Emory from 28 states, Puerto Rico and seven different countries. They are graduates of 65 different undergraduate institutions; 15 already have post-graduate degrees, including three with PhD degrees. The Emory Genetic Counseling Training Program Class of 2020began their training Aug. 20. The incoming class has 11 students, 10 women and one man, including three from under-represented minority groups and one who is a first-generation college student. Physical Therapy Program: DPT I class welcomes 72 students, 18 male and 54 female. 24 states are represented in the class, along with two international students. Incoming Physician’s Assistant Class of 2020:The Class of 2020 began their first year of PA school at the beginning of August. The incoming class has 54 students, with 76 percent women, 30 percent under-represented minorities, and 100 percent non-traditional (one or more years out of college prior to beginning PA school). The Emory Anesthesiology Assistant ProgramClass of 2019 began their academic endeavors with Emory in June of 2017. The class is composed of 53 percent women. They hail from many states and geographical regions with the furthest being India. We have a dynamic mix of nontraditional students who have held prior clinical positions or held various roles in other professional careers. Focus on Innovation: With the arrival of Dean Vikas Sukhatme, MD, ScD, the SOM has renewed its focus on innovation and connectivity between our three-part mission of research, teaching and clinical care. To further enable collaboration and creative thinking, we recently launched the SOM Imagine, Innovate and Impact Awards. Awards will be presented in two categories, transformational research ideas and novel ideas in medical education. Increasing diversity: We are proud to note that 23 percent of Emory School of Medicine’s entering first-year students this fall are black, the highest in the school’s history. Our Executive Committee on Diversity, Equity and Inclusion is leading and supporting efforts to increase diversity and inclusion within the school. We also focus on pipeline programs that increase exposure to medical fields and provide college preparation to students who may not otherwise have access. New leader and training: Scott D. Boden, MD, has been appointed Chair of Orthopaedics for Emory School of Medicine and Chief of Orthopaedics and the Musculoskeletal Service Line for Emory Healthcare. Graduate Medical Education: We have developed interdisciplinary resident training tracks for highly motivated residents across all specialties who are interested in supplementing their core training. There are now five active tracks in focused on Global Health, Quality Improvement/Patient Safety, Ethics, Medical Education and Healthcare Management. Two additional tracks are in development and focus on Health Equity, Advocacy, and Policy and Biomedical Innovation.